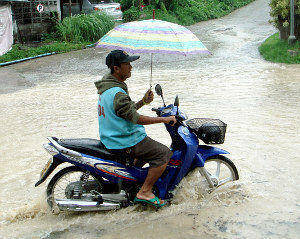 If you are traveling only on two wheels is always warned from wetness. You can drive on eggshells just yet. The braking distance is extended by 10 times and when you get to a white line is the same anyway lubricates from …? So it is always maintained, while there are at the present-day road tires almost no problems in the wet. Even Super Sport tires like the Bridgestone S20, Metzeler Sportec M7 rr or Michelin Pilot Power are absolutely watertight fit! Sure, when rain can first form through the mud on the road, a lubricating film, and basically you have to adjust the speed of the circumstances, but not a reason to get all panic and turn off the bike the same. Problem is usually not the lack of grip or aquaplaning. Important, the temperature window in which the tire operates. Due to the humidity and the restrained driving style the tire cools rapidly. Then drops the temperature from the temperature window is lost the grip. This does not abruptly but gradually. However, modern tires also have a very large temperature window so this is usually not a problem. On the track, it looks different, here the tires should have about 80 degrees (Slick) which is a bit difficult when it rains. Hydroplaning is due to the relatively small footprint of the motorcycle tire rare. In puddles you should not drive at full throttle, however, because if you do because sometimes slips one already is mostly on the road. Hier mal ein Link von “Motorrad” zum Thema Grip im Allgemeinen. Main problem with riding in the rain, as in most cases, one’s own head. One thinks it is no longer, or panics and reacts wrong. But the cramping on the handlebars is very dangerous. One should in principle always enjoy a relaxed drive! Riding in the rain – no problem! If you drive a relaxed can withstand even the rain. However, remember that the proper clothing is necessary. When you’re first really wet and then freezes relaxed driving is no longer possible! A round driving style is also very helpful when wet. To avoid skew can also use the Hanging off. By shifting your weight you are despite less skew faster, or even at the same speed less oblique and thus safer. The more power you have the more soulful throttle hand should be. Against the poor visibility, there are various polishes for the visor. Thus already the drops fly downright away at low speed. Here is an example of how it makes a pro. The big difference is not the great experience or great talent, but that he was driving without fear and knows what he is doing!